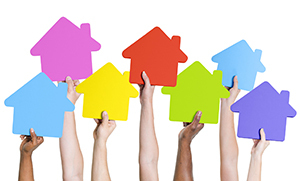 Home buyers have several different choices that they can make when they go for mortgage. Below are different types of mortgages that are available to you and we have tried to explain them in as much detail as possible. As a house owner, you may be in a dilemma whether you must select the fixed rate or adjustable rate mortgage. When you opt for fixed rate mortgage, the rate of interest does not vary regardless of your repayment term. Hence your monthly mortgage amount remains the same. This is true for long term financial programs as well. This is a great option in fluctuating and improving markets in future where rate of interest may keep going higher and higher. When the rate of interest varies from time to time, this is termed as adjustable rate of interest. The interest rates can be easily adjusted from time to time after the initial period of remaining fixed. Hence it has the name ‘hybrid product’. For example, 5/1 ARM has a fixed interest rate for the first 5 years, and then has a variable rate depending upon the market conditions and every 1 year the rate is adjusted. The Federal Government insures houses through the FHA programs and this is all managed by the HUD (Department of Housing and Urban Development). FHA is applicable to not just first time buyers, but also any kind of buyers, and investors. This program insures the lender against the losses upon borrower default. This also allows you to make a minimum of 3.5% down payment of the purchase cost. However, you will have to pay more mortgage due course and this increases your monthly payments. US department of Veterans Affairs (VA) offers mortgage loans to Veterans and expects no down payment from the borrowers. The US Agricultural department offers loan to rural borrowers who belong to the low income category and are unable to obtain inadequate housing capability. These loans are not guaranteed by the Federal Government and hence there is no insurance provided by them to the borrowers. This definitely differentiates between the Government offered loans like VA, FHA and USDA. When the amount of loan is huge, lenders offer mainly 2 types of mortgage loans namely, jumbo and conforming loans. This type of mortgage loan offers restrictions from the Freddie and Fannie rules. Besides this, there is a much higher risk for the borrowers due to its size and the name itself depicts. Hence the lenders would expect that the borrowers need to have excellent credit as well as higher down payment. Besides this, the overall interest rates are higher as well. This type of mortgage loans meet the underwriting guidelines set by Freddie and Fannie which are Government controlled and pursue buying and selling of MBS (mortgage backed securities). There is a maximum limits to this type of loan or the one that meets the specified criteria.